Short and sweet is far better than long and boring. Listen, we all love the sound of our own voices but the rest of the guests may not. It’s a wedding, not “This is Your Life”. And in all likelihood, the large majority of people in attendance will know the rough outline of the subject’s life so far, so there’s no need to cover every part of the baby book and beyond. Guests are either hungry and impatient or happily settled in a carb coma; cosy, sated and probably a little bit tiddled. So remember: quality over quantity and stick to 10 minutes maximum, in my humble opinion. Pick the highlights. On the subject of quality, you don’t need to tell every single funny/interesting story about the person you’re speaking of. Write a few down, sure, but test it on someone impartial and see which they find most relatable and which gives a good summary of the person, or your relationship to them. Remember that if there’s more you want to convey to your loved one, you can always do so in private or a card. In-jokes aren’t funny for everyone. There may be the odd (and ideally brief) nod to something truly personal and hilarious that only you, the subject, and a small handful of others can appreciate, but don’t forget that for everyone else they’ll just be like...”new phone who dis?” and go in search of more wine or something interesting on Instagram. Don’t try too hard to be funny. Look, we all love a witty speech, but for some people it’s just not their comfort zone and you can always tell. It’s far more awkward watching someone try (and fail) to get some laughs than someone who doesn’t try at all. If it feels like a struggle when you’re writing it, I can promise it will show on the day. Instead, be sincere, speak from the heart and people will engage with it far better. Don’t start your speech by saying “well I looked on the internet and it said....”. Honestly there’s just no need, it’s a waste of precious minutes (see point 1) and it’s basically not interesting. Same goes for the standard formula jokes we’ve all heard before - they’re tired, boring and usually sexist. If you’re saying something heartfelt that is, in theory, a present thought, don’t read it from your notes. Seriously, if you’re saying “you look absolutely beautiful today”, look that person in the eye and say it like you mean it and haven’t written it 10 days earlier hoping that it would be true. Reading from a script is okay, but don’t forget to look up occasionally. Hold your finger at the point you’re reading so you can easily see where you left off when you look down again. If you’re nervous, read from a card or screen - paper only highlights shaky hands. Practice will help so don’t leave writing it to the last minute. And most importantly, if you’re using a microphone, PLEASE remember you must speak into it the WHOLE time. I cannot stress how quickly you’ll lose crowd interest if they’re missing every third word while you’re page-turning with your mic hand. Read the room. Whether you’re using a script or not, try not to be scared of looking around and seeing what people’s faces are saying. 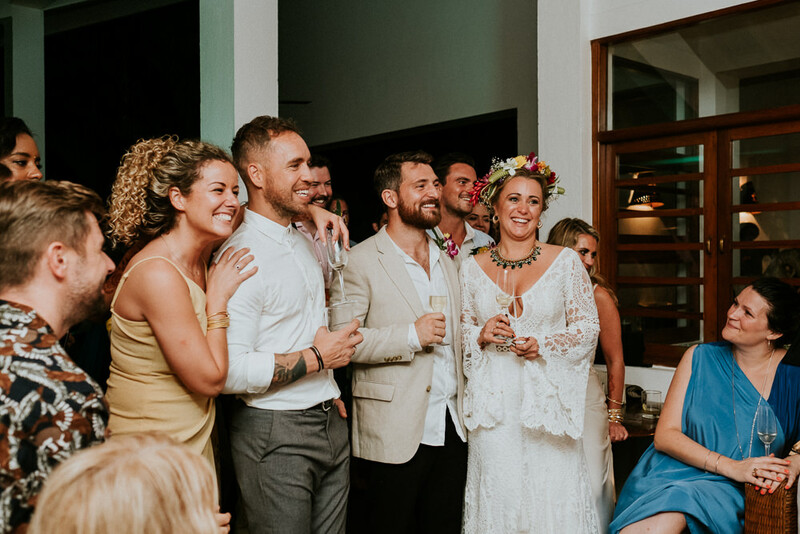 If they’re looking bored or your jokes aren’t landing as you’d hoped, wrap things up a little quicker and again, if in doubt say something heartfelt - there’s no time when people begrudge hearing kind words on a wedding day, as long as they’re sincere. This also works for that morally questionable or risqué story you want to tell; save it as a maybe, depending on how the crowd is reacting. If it seems like they’re in the mood, go for it. You don’t have to take the piss the *entire* time. This is particularly aimed at best men: sure, it’s great to poke fun at the groom, but the fragile male ego aside, you don’t have to make the whole speech about it. It gets less funny as you go on, and sometimes it can even be a bit cringeworthy. So make sure you have time to say something nice, and also don’t forget about their new husband or wife! Generally most best men will say that the bride and bridesmaids look beautiful, but how about a nice word or two about their personality, and the couple’s relationship? If you’re going freestyle, try not to waffle or talk yourself into circles. Be aware of what you’re saying and don’t repeat it. If you’re afraid of an awkward silence, you can always rely on a trusty toast for everyone to clap and cheer while you gather your thoughts. So there you have it. Can I take my own advice and put any of this into practice myself? Who knows. We’ll find out on 30th March. If you ARE giving a speech this year, know that we’re all rooting for you and you can absolutely DO THIS.